After studying Literature and Philosophy in Madrid (1880-1884), he received a doctorate at the age of twenty. In 1891 he won the Chair in Greek at Salamanca, and was rector of the university from 1901 (except for several brief interruptions) until his death. 1884-1897: from the doctoral thesis (Crítica del problema sobre el origen y preistoria de la raza vasca) to a religious crisis. In this period, Spain and the problems of Europeization, regionalism, Carlism, the social question, and language as an expression of the ‘soul’ of the nation occupy his attention. His principal works, apart from the doctoral thesis, are the essays collected in En torno al casticismo (1895) and a novel: Paz en la guerra (1897). 1897-1913: a period dedicated to religious problems, and to immortality as the source of life’s meaning. From this concept he develops the oppositions between pistis/gnosis, love and pedagogy, science and religion, and faith and reason. He describes Quixotism as a life according to faith, Spanish popular Catholicism as a reaction to European modernity, and polemicizes against the culturalism of Ortega y Gasset. These themes begin to emerge in three essays written in 1900: ¡Adentro!, La ideocrazia, La fe. 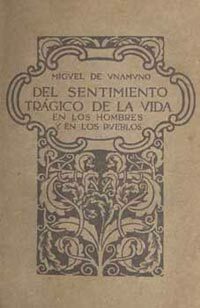 They are then further developed in Amor y pedagogía (1902); Vida de don Quijote y Sancho (1905); Del Sentimiento trágico de la vida (1912). 1913-1927: During this period Unamuno dedicates himself primarily to writing novels, as a way of studying the intimate contradictions of personality. This can be seen in: Niebla (1914), Cómo se hace una novela (1927), and El otro (1926), in which the intimate contradiction of a personality is dramatized in the struggle between two brothers. El Cristo de Velázquez (1920), Canto a Teresa (1924)and La agonía del cristianismo (1924) were also written during this period. 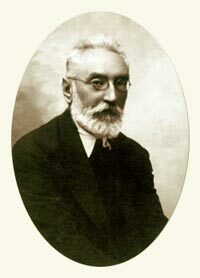 1927-1936: This period witnessed an attempt at sythesis on the part of Unamuno, as in the novel San Manuel Bueno, mártir, which is a kind of summary of the ideas dearest to him. A nostalgic vision of the past is also evident in his writings on the Republic from this period: República española y España repúblicana 1931-1936 (Salamanca 1979). Main works: Obras Completas, IX voll., Madrid 1966; Escritos socialistas, Madrid 1976; República española y España repúblicana 1931-1936, Salamanca 1979; El resentimiento trágico de la vida, Madrid 1991; Artículos en la Nación de Buenos Aires, Salamanca 1994; Nuevo mundo, Madrid 1994; De patriotismo espiritual, Salamanca 1997; Unamuno y el socialismo. Artículos recuperados (1886-1928), Granada 1997; Escritos inéditos sobre Euskadi, Bilbao 1998. Bibliography: «Cuadernos de la Cátedra M. de Unamuno», ed. Univ. de Salamanca; P. Cerezo Galán, Las máscaras de lo trágico, Madrid 1996; C.L. Ferraro, Benedetto Croce e Miguel de Unamuno. Comparazione di due “sistemi” di pensiero, Citta di Castello (PG) 2004; Ib., Luigi Pirandello e Miguel de Unamuno: fra “identità” e “creazione del personaggio”, «Rivista di Filosofia Neo-Scolastica», XCIX, Aprile-Giugno 2007; Ib., La novela de la tierra de G. Verga y ‘Paz en la guerra’ de M. de Unamuno, «Revista de Literatura», LXX, julio-diciembre 2008, CSIC, Madrid; M. García Blanco, En torno a Unamuno, Madrid, Taurus 1965; V. González Martín, La cultura italiana en M. de Unamuno, Salamanca, Ediciones Universidad de Salamanca 1978; J. Marías, M. de Unamuno, Madrid, Espasa-Calpe 1980; C. Morón Arroyo, Hacia el sistema de Unamuno. 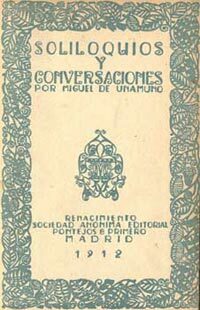 Estudios sobre su pensamiento y obra literaria, Palencia, Ediciones Calamo 2003; N. Orringer, Unamuno y los protestantes liberales, Madrid 1985; E. Salcedo, Vida de don Miguel, Salamanca, Anaya 1964; M. Zambrano, Unamuno, Barcelona, Debate 2003. The personal library of Miguel de Unamuno consists of approximately 6,000 volumes and is conserved in the Casa-Museo Unamuno, the old rector’s residence, which was turned into a museum after his death. It contains manuscripts, letters, and books from the collection of don Miguel. search by string: author, title, subject, etc. Once you have obtained access to the volumes that correspond to the search term, use the “find” command for “Unamuno”; afterward the volumes from the Casa-Museo Unamuno that correspond will appear. Once a search by author has been completed, the “LIMITAR ESTA BUSQUEDA” option can be used, and “Biblioteca Casa-Museo Unamuno” should be placed in the “UBICATION DEL EJEMPLAR”.... = UBICACION field. Afterward, if the shelf-mark is: U/(number), the text belongs to Unamuno’s personal library. If, on the other hand, the shelf-mark is: U/(number)cor, then it belongs to the “Biblioteca moderna’.